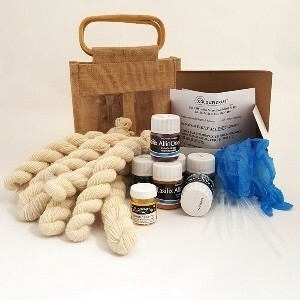 Everything you need to start dyeing animal yarns or fabrics made from wool, mohair, alpaca, nylon, angora, cashmere and silk plus 200g of 4ply pure wool - ideal for socks. This yarn is great for socks as it’s fairly hardwearing and won’t felt. 200g will go a long way, so there’ll be plenty for a hat, scarf or even a top.